How Did “Right to Work” Happen in Wisconsin? 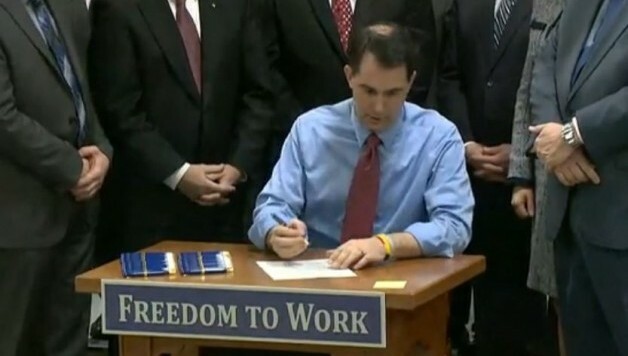 On Monday, March 9, Wisconsin governor Scott Walker signed into law a bill making the state the 25th “right to work” state in the country. This is a serious setback for the labor movement nationwide. It will encourage further attacks on working people in Wisconsin and in many other states. Despite its pleasant-sounding name, “right to work” does not give anyone the right to a job. It gives someone the right to benefit from union activity without having to pay into the union. If 75% of workers vote to unionize, the 25% who voted no could receive all of the gains won from collective bargaining without paying into the system. As many union leaders have said, it is comparable to your neighbor wanting his street plowed, but not wanting to pay taxes for it, hoping just to rely on your choice to pay. It is a clever way to cut off a union’s ability to collect money, and ultimately to dwindle union membership and influence. As an example of its effects, “right to work” states have 54% higher workplace fatalities than states with union rights. Four years earlier, Walker provoked a mass uprising when he drastically curtailed collective bargaining rights for public sector unions. This was the notorious “Budget Repair Bill”, later renamed “Act 10”. At the time, anti-union propaganda claimed that the public-sector workers were “privileged” and that they needed to make sacrifices “just like the rest of us”. But, behind closed doors, Walker himself admitted that this was a “divide-and-conquer” tactic. And with the passage of “right to work”, that cycle is complete. This outcome, however, was not inevitable. Just as Act 10 could have been defeated by the united power of the working class, the “right to work” legislation could have also been defeated if the workers had been empowered to fight back. It is clear that the defeat in 2011 has had an effect on workers willingness to fight. But the union leadership has used this as an excuse for their own conservative approach. If they had systematically prepared for this fight and issued a bold call to action many workers would have responded and the fightback could have caught fire. Socialist Alternative called for the protests to take on a coordinated, state-wide, and more militant character as a first step towards more serious action. Many workers we talked to agreed. Yet, the response from the majority of the labor leadership was uninspiring. This speech was met with enormous applause. Yet, the majority of speeches focused on positive partnerships with businesses and how important the Democrats have been in denouncing this legislation. Once again, the leadership of the unions have decided to look for solutions in every possible corner, but from the collective strength of their own membership. Relying on legal challenges, letter writing, and PR campaigns will in no way change participation levels in a positive way. If strike action, occupations, and direct actions had been posed as a legitimate means to confront the right wing and prevent this legislation from passing, there would have been intense debate within the unions, and the workers would have been engaged in this debate. To understand how we got to a”right to work” Wisconsin, it is essential to also understand Act 10 and the Wisconsin uprising of February and March 2011. This was the first phase of Walker’s two part plan to crush labor unions in Wisconsin. As many will remember, the events of February and March 2011 were incredibly inspiring. 200,000 people in the streets of Madison, an occupation of the Capitol that lasted for two weeks, a well coordinated and prolonged sickout of Madison teachers. There was an inspiring level of solidarity and hope to “kill the bill”, but also dreams of a better world. Keep in mind, while this uprising in Wisconsin was happening, the Egyptian Revolution was underway. Wisconsin workers were referencing the struggle of Egyptian workers to give inspiration and guidance to their own battle, and Egyptian revolutionaries were sending in messages of solidarity. 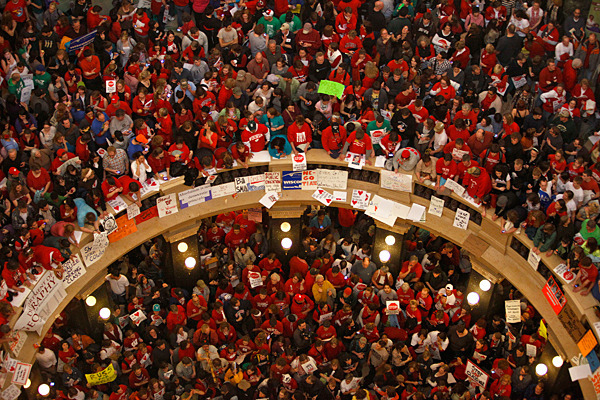 In the uprising of 2011, Socialist Alternative was at the massive demonstrations, organizing to spread the idea of a one-day, statewide, public sector general strike. Imagine teachers, librarians, bus drivers, snow plow drivers, some of the garbage collectors, road construction workers, and clerks all taking a coordinated stand. While this alone would not have stopped Act 10, it would have been an essential step to give confidence to the working class and to develop the level of networking and organization necessary to take bolder action. Promoting coordinated strike action was not just a dream of “extremist” elements and widely discussed. It was on the table. The South Central Federation of Labor, representing over 100 unions voted to promote and educate members on the ideas of a general strike as a means to combat Act 10. It was seen on signs and heard in voices throughout the protests. Fearing the risks of serious action, the statewide and national labor leadership chose supposedly “safer” routes, routes which we warned were doomed to failure. The talk of strike died away and shifted to official chants and slogans around the idea of a recall election and legal challenges. The Democratic candidates thrown up to challenge Walker were truly an unimpressive bunch. In fact, not one of the challengers was bold enough to advocate for a complete reversal of Act 10. Think about it, not one candidate was progressive enough to say, “if elected, I will make Wisconsin just like it was the day before Act 10 was signed into law.” Only one candidate, Kathleen Falk, promised to restore bargaining rights. But she was deemed too far to the left by Democratic strategists and political writers, despite the fact that she was fine with the massive economic attacks on public sector workers. Ultimately, Mayor Tom Barrett of Milwaukee was chosen to run against Walker. Barrett had used Act 10 against teachers in his city and had expressed an interest in expanding Act 10 so he could go after the benefits received by police and firefighters. Barrett used the campaign slogan “put Madison on a diet” and gave no plans on how he would actually challenge or overturn Act 10. He had already been defeated by Walker in 2010. However, when he was selected, the union leadership all fell behind him despite his rotten anti-worker record and his history of failure. This was a strategy destined for defeat whether Barrett won or lost. Thousands of ordinary Wisconsinites sacrificed an extraordinary amount of time and resources to support the recall, seeing it as the only legitimate hope of stopping the attacks. As the recall went down in flames, Wisconsin workers went through a long-period of demoralization. In reality we have yet to cease paying for not going on strike in 2011. It hasn’t just been Wisconsin that suffered from Walker’s win. Seeing that workers did not strike ors eriously disrupt economic activity, right wing governors throughout the Midwest began to challenge the unions. “right to work” legislation was introduced in a whole series of states in the Midwest including Wisconsin, Indiana, Missouri, Ohio, and Michigan while Illinois public employees were hit with a pension heist from their Democratic governor. 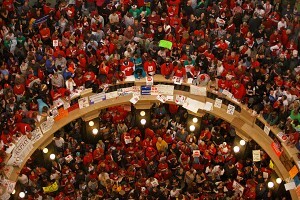 Indiana passed “right to work” in 2012. After Michigan, the birthplace of the UAW and some of the most heroic working class struggles of the 20th century went “right to work” without a serious fight in the same year, it became clear that the current union leadership and its reliance on the Democratic Party had absolutely no viable solutions to stop this tide. While the right wing of the Republicans wants to smash the unions outright, the Democrats want to maintain the unions but in a seriously weakened state. In many states they have pushed through vicious attacks on union members over pension rights, healthcare, etc. The party is opposed to serious workers’ struggles, but clearly wants to maintain the massive financial support they receive from the unions. This sounds good but one must not forget that in the first two years of his administration when the Democrats controlled both Houses of Congress, he dropped his previous commitment to support the Employee Free Choice Act, which would have made union organizing far easier. This was done because of the strong objection of corporate America. Since then the Obama administration has also supported attacks on the teacher unions, the strongest public sector unions, including the union-busting Vergara decision in California. While the president supports raising the federal minimum wage and certain other reforms, when union rights and corporate interests are in sharp conflict he sides with the latter. Walker has pretty much achieved everything that he has set out to do. After the defeat of the recall, rumors of his plans to fulfill the second half of his divide and conquer strategy popped up. However, it wasn’t until the midterm elections, when the Wisconsin legislature went deeper into Republican hands that a few senators announced plans to put forward a “right to work” bill. Many felt some amount of comfort that Walker has White House dreams, and that he wouldn’t want to risk another huge fight like Act 10. Others took him seriously when he stated that so called “right to work” legislation would be a distraction and it was not on his agenda. Unfortunately, the Iowa conservatives and Koch Brothers’ empire must have had other ideas in mind for Walker. Following on the heels of a massive $300 million budget cut and a plan to restructure the governance system of the University of Wisconsin, Senator Scott Fitzgerald announced that he not only had the votes to achieve “right to work”, but was also planning to fast track the legislation. Walker had said that the legislation would be signed when it reached his desk, and he followed through. The time for action, largely passed with a timid response from unions. This serious setback naturally raises the question of what strategy can rebuild a fighting labor movement in this country. What is urgently needed is a strategy that relies on the power of the working class. The class that builds our cities, teaches our youth, produces and transports our consumer goods. We seek a strategy based on the class that is both numerically the largest class, but also the class from whom all wealth is created. This is a power far greater than that of lawyers and politicians. The lessons of 2011 are clear. Without decisive action defeats are inevitable. It is going to be up to the left wing of the trade union movement to get organized and to begin aggressively advocating for class struggle tactics. The working class and the employing class have nothing in common. They seek to exploit our labor for their gain. A fighting approach built the labor movement in the first place, and these are the only tactics that can save the labor movement today. In the 1934 trade unionists nationally faced a situation every bit as difficult as “right to work” when socialists led historic strikes in San Francisco, Toledo, and Minneapolis that forever changed the face of unionism, opening the doors wide to whole sectors of unskilled and mid-skilled laborers. Such actions could once again swing open the doors to the house of labor, but this isn’t going to happen spontaneously . It is going to take organization and it is going to take building up a coherent left force in the unions to intervene and to democratically discuss the best methods to challenge the bosses. As in the past socialists have a critical role to play in this process. Whether “right to work” is defeated today, tomorrow, next year, or never, depends on one critical factor. That is when the working class decides to take off the gloves and deliver the first counter-punch. The fate of the labor movement in Wisconsin has not been sealed by the passing of “right to work.” However, in order to stay afloat and grow in numbers and importance, a fighting strategy will have to look outward toward the entire working class. We will have to organize the unorganized and to break out of a dead end legalistic organizing framework. The unions should immediately ally with the Black Lives Matter movement, whose energy and willingness to take risks is exactly what is sorely needed right now across all social movements. Unions need to to prove that they are fighting for the entire working class by fighting for a $15 minimum wage at the local, state and federal level. In order to retain the current membership levels, the leadership will have to empower workers to take the action needed to win gains and not just negotiate concessions. Nothing will be accomplished without organization. “right to work” is a well thought out and carefully planned initiative to transfer wealth from workers to bosses. It was put into play in Wisconsin because the bosses are organized. It was put into play because the bosses have a capitalist strategy. They understand class war. It’s time that workers get organized and fight back.